A smoked ham hock is a cut of meat taken from between the foot and leg that has been smoked to add flavor. 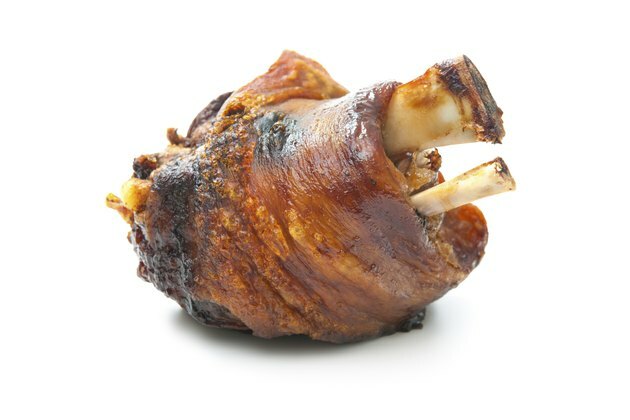 Ham hocks are generally tough but flavorful cuts of meat because they contain muscle and tendon as well as a fair amount of fat, which means they need to be cooked fairly slowly at a lower temperature to make the meat tender. Ham hocks are often braised in liquid, and you can use leftovers for soups and stews. Line a medium baking dish with aluminum foil and place the ham hock inside. Combine the honey and mustard in a small saucepan and heat it over low heat, stirring it constantly with a wooden spoon until combined, about one minute. Brush the top of the ham hock with the honey and mustard mixture. Season the ham hock with kosher salt and coarse ground black pepper to taste. Cook the ham hock in the oven for 40 minutes. Check the internal temperature of the ham hock with an instant-read thermometer. When the ham hock is finished the internal temperature should be 140 degrees Fahrenheit. Remove the ham hock from the oven. Place it on a cutting board and allow it to rest for 10 minutes before slicing it and serving. Ham hock, approximately 2 lbs. You can omit the mustard if you prefer a sweeter taste. Alternately, use spicy Russian mustard or bold German mustard for a more intense flavor.